Doesn’t look much different than last time, but it’s much closer to coming out now. Recap: Since the original 307 is very tired, I decided to build a 350 for the Chevelle to swap in while conveniently having the rest of the front end apart for some cleaning / repairs. 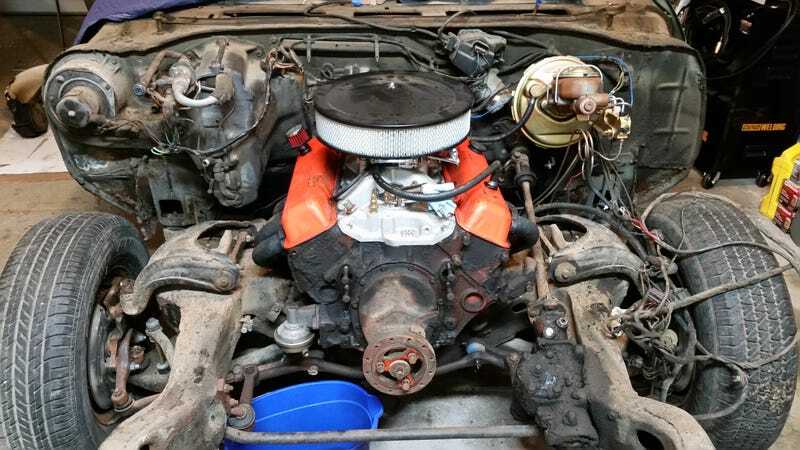 This process started by buying a used 350 which I intended to do a simple rebuild on with some good heads and a cam and be ready to go. Things have not gone to plan. When I tore down the engine, I found it had been rebuilt before. The piston/bore clearance was at a maximum, and there was rust pitting in #2. This means it needs bored out, which also means buying pistons. Not the end of the world. When I took the bottom end apart, I found a mis-match of a couple different styles of (factory) rods and quite a bit of bearing wear. Not great. I spoke with the machine shop today, where the block has been cleaned and pressure tested (it passed). It needs a line hone and, while he hasn’t measured the bores yet, we agree it sure looks like it needs bored out. The crank has been cleaned and needs polished at a minimum (hadn’t looked closely enough yet to see if it would need a grind). Since nobody reads posts like this that are rambling walls of text, congratulations on making it this far. While on the phone, we both reached the same conclusion - I’m buying pistons, I’m buying rods, and the crank needs work. Why not just stroke it? The only difference is that I need a different flywheel than I have now; otherwise it’s buying parts I would have been buying anyways and a new crank (instead of machine work on the old one). This adds cost (the whole point of the donor 350 was to not have to buy bottom-end parts but that went out the window a while ago) but, hey, now I’m building a 383.